In the dead heat of August, your outdoor entertainment area can be a private oasis full of fun, rest, and relaxation. Or, it can be a place that feels (and burns) like Death Valley when the temps reach triple digits. Unless your backyard is well-equipped to battle the seasonal heat, the latter is usually the case. Fortunately, a quality design with the right features has the potential to turn backyard hell into heavenly leisure–no matter the season. A well-designed outdoor space can mean the difference between year-round and seasonal use. 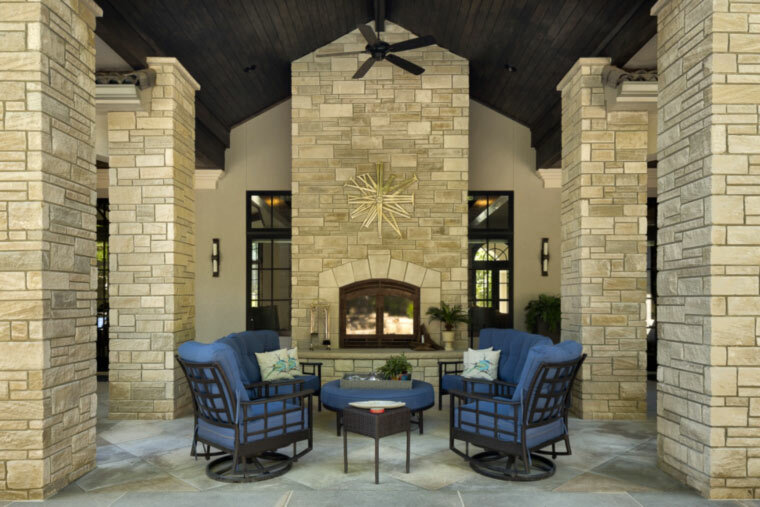 Design features like fire pits, kitchens, pergolas, covered sitting areas, pools, and more add to the versatility of the space. Structural design plays a large part in determining the area’s overall maintenance, layout, and durability against the elements. Essentially, a tailor-made design will help transition your outdoor space from one climate to the next. Many outdoor features can be enjoyed during most seasons. 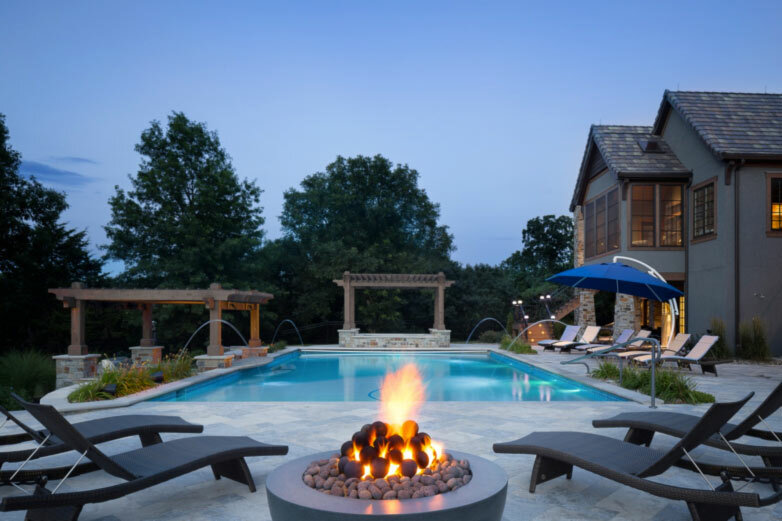 For example, fireplaces and fire pits—like the ones our friends at Hinkle Hardscapes specialize in—can be gathered around on cool, clear nights for roasting marshmallows, star-gazing, and friendly get-togethers. They also create a warm, comfortable atmosphere perfect for entertaining. Outdoor living rooms and kitchens are also features that can be used anytime of the year, weather-permitting. 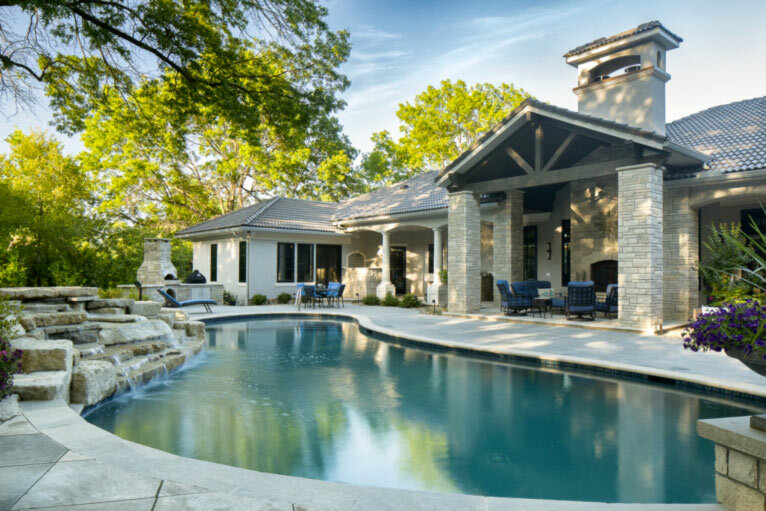 Weather protection by way of permanent roofing, like pergolas, overhangs, and gazebos, can significantly prolong backyard “chillin’ and grillin'” season. More temporary measures, like canopies, retractable shades, shade sails, and awnings, are great for good weather days, but may not fare well in the elements. Additional features, such as heating appliances—gas patio heaters and wall-mounted infrared heaters—can also be installed to adapt the area to chillier weather. Interactive water features like pools may not be as pleasant to jump into during the colder months (hypothermia anyone? ), but that doesn’t mean they can’t still be enjoyable. They can act as a beautiful, aesthetic addition to your outdoor events, especially when they sport their own lighting, jets, and waterfalls. Though, we recommend investing in a pool heater or an adjacent hot tub if you’re craving a mid-winter dip. Any selection of these many design features can be modified to fit your budget, space, and recreational preference. Furthermore, many features can complement each other to fully maximize the transitional use of your outdoor oasis. Going beyond the aesthetically-pleasing design features is the built-in structural design of your outdoor space. The overall design can greatly affect how and when you can enjoy it. For example, if the direction that your space faces is toward the west, then you may have to deal with some sun in your eyes during the late afternoon and evenings (and being blinded isn’t a popular dinner topic.). A smart structural design will take several factors into account, such as the physical layout of your home and other structures, the landscape geography, and the local climate. The layout of the surrounding home and structures will affect the extent of outdoor elements that your backyard will be subject to. A good design will play off the structures to try to allow for an adequate amount of shade, sun, and weather protection. Landscape geography—trees, slopes, runoff areas, soil composition, etc.—affects everything from the foundation to the proper building materials. A bad design can turn your outdoor oasis into a nightmare with issues like flooding (leading to ice in the winter), lack of structural integrity, and poor accessibility. All of these un-pleasantries can be avoided if your backyard’s unique geography is taken into account. Lastly, the local climate can wreak havoc if your space isn’t designed to withstand it. Of course, not all climate-related events can be foreseen and protected against, but some careful weather proofing can save a few headaches when the next storm hits. Specifically, structural additions like overhangs, gutters, and drainage areas can help divert heavy precipitation, while weather-proof building materials will help maintain structural integrity. Taking the time to winterize is also highly recommended. With the appropriate features and a thoughtful design, there is no reason not to enjoy your outdoor entertainment area from season to season. If you’re considering turning your summertime oasis into year-round heaven, the cooler days of fall are a great time to begin. But for now, kick back, relax, and enjoy the last few weeks of summer.